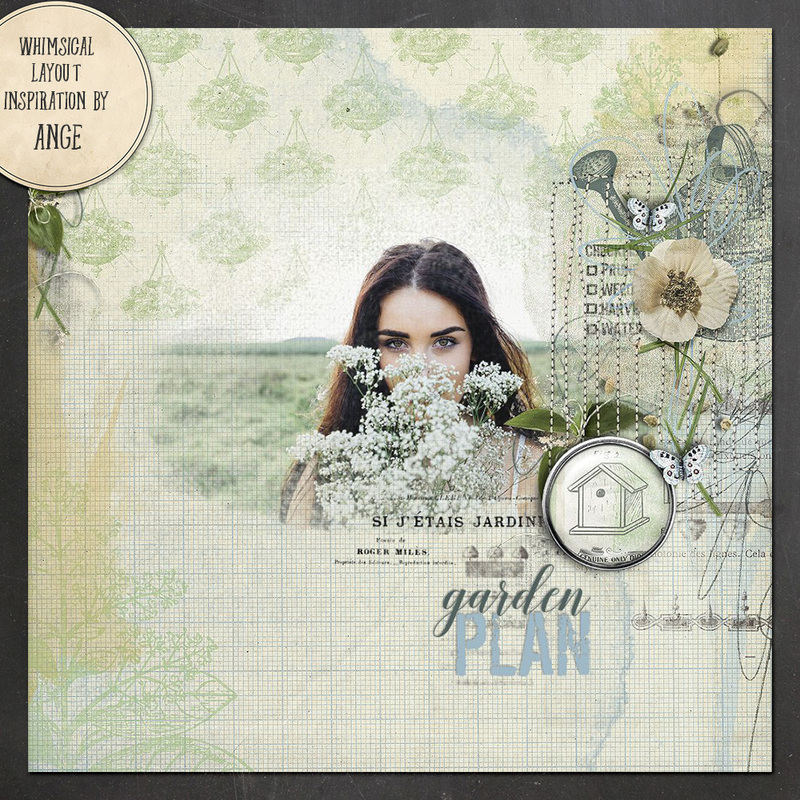 All that has brought me the inspiration to design a garden themed kit. It took me like forever to finish it, and it was not for lack of inspiration. I just reworked it and reworked it, changed the colours, added things, removed things… Then I had the idea of adding illustrations that I made myself, with a pen from a Zentangle pen set that I accidently ordered (and decided to keep – maybe it was saying to me, “start drawing again”? 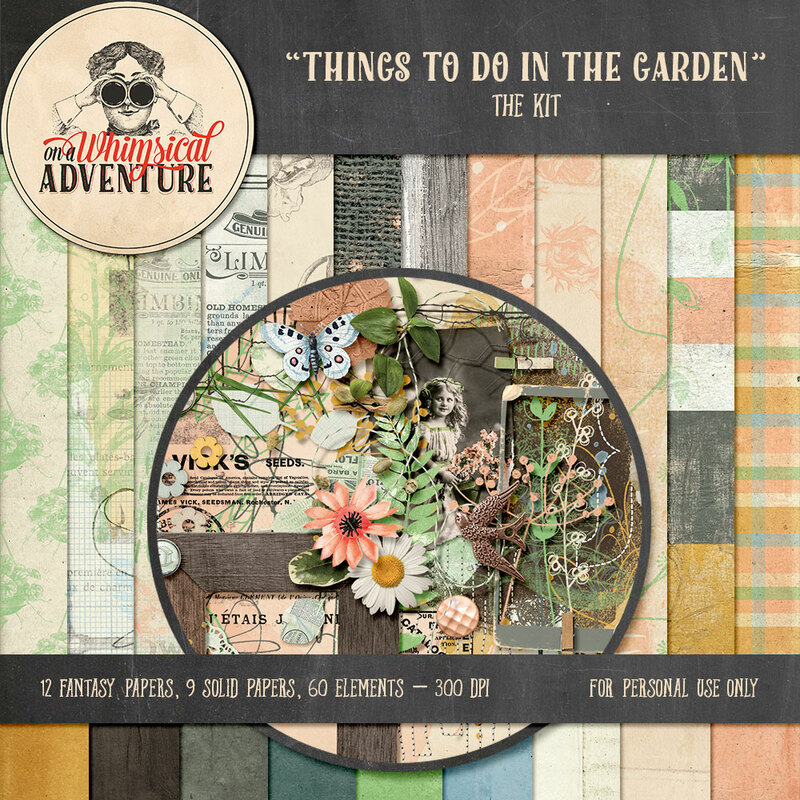 )… and so ‘Things to do in the garden’ has become a whimsical digital scrapbooking collection with fantastic vintage and artsy patterns and mixed media designs that will make you wish you had a garden, whether you like gardening or not. 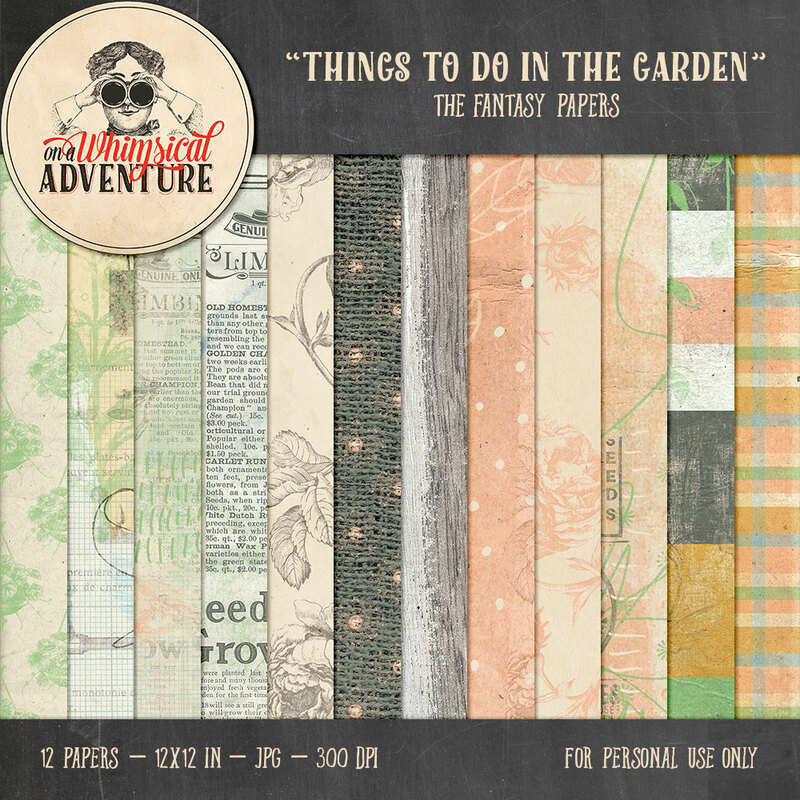 The papers and elements are a delightful mix of vintage, realistic, mixed media and handdrawn illustrations. Colours are ranging from brown, clay and blue over fresh green, peach and golden yellow. 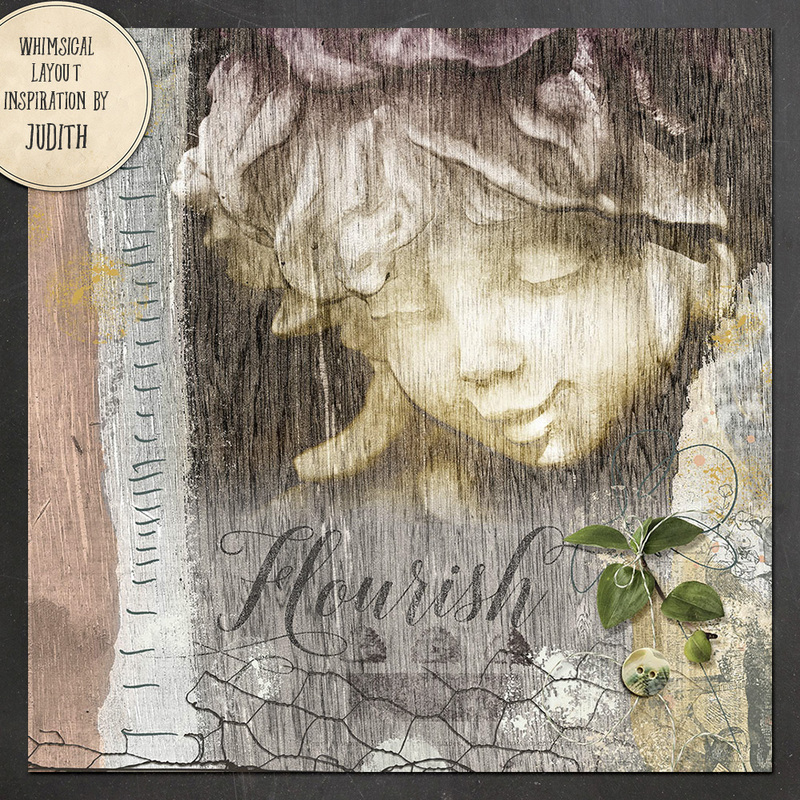 The textures are rich and distressed, and you will surely love all the stamps, the floral illustrations, the scribbles, the transfers and the word art. 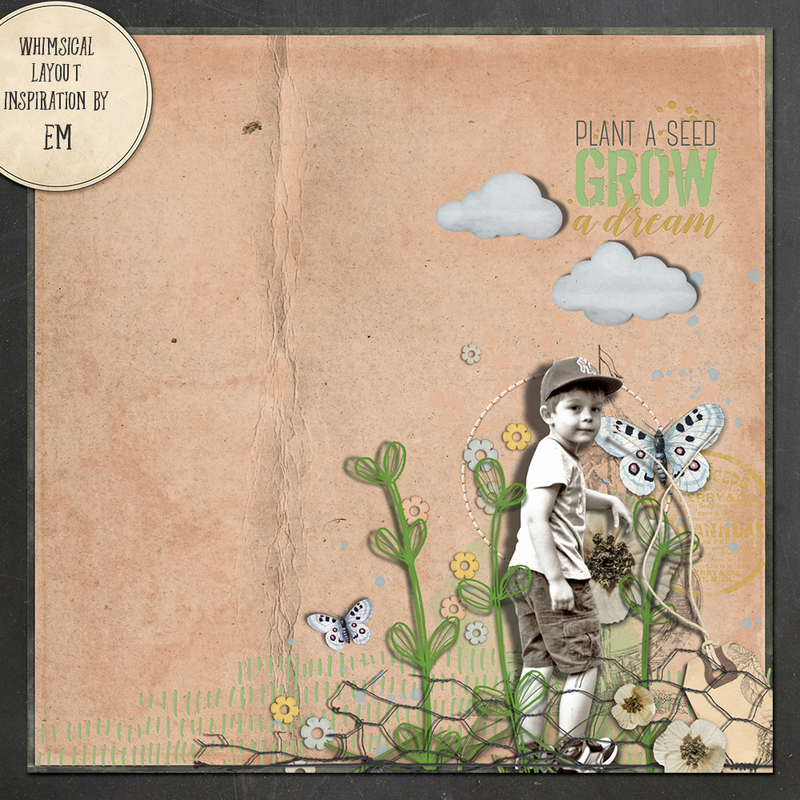 This garden themed collection will help you show off your love of all things green, and will help you create unique and gorgeous pages about your garden adventures and all sorts of other nature and outdoor themed memories. Curious? 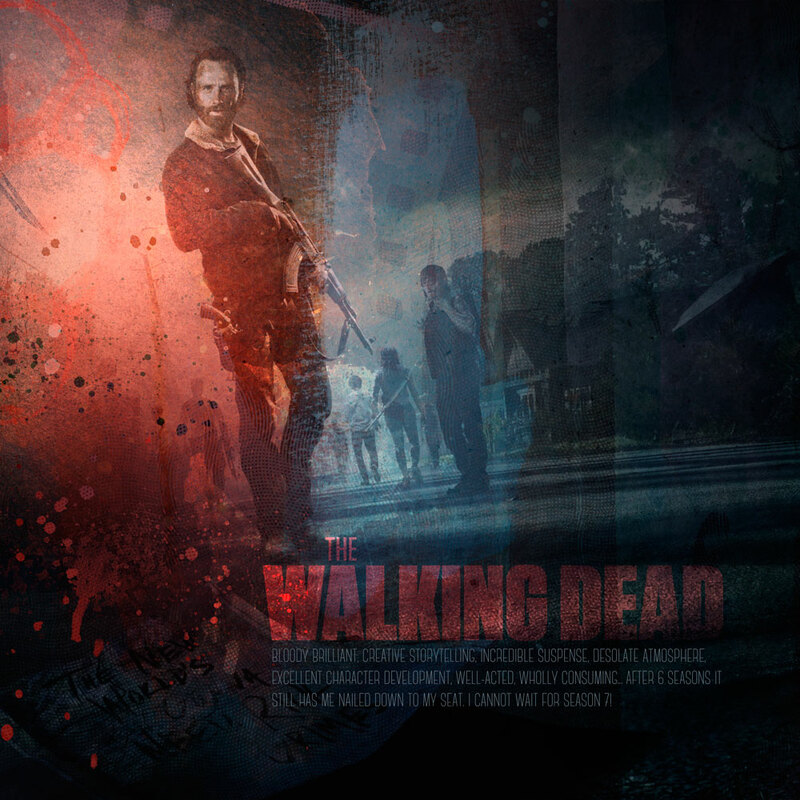 Let’s go see some previews! As always, the bundle is your best deal. Papers and elements in one package, permanently discounted. 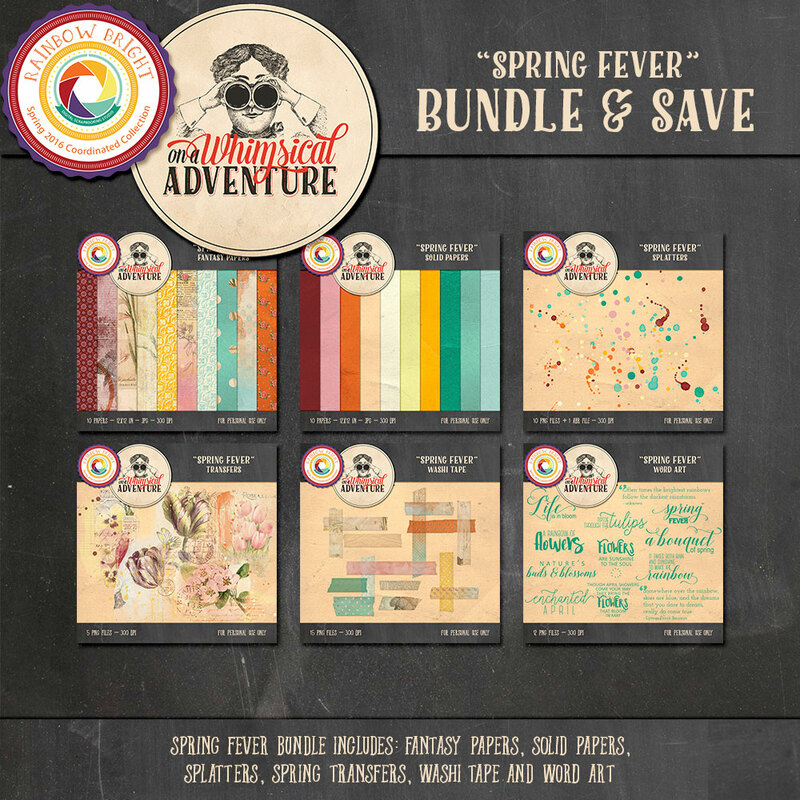 The bundle is available at Digital Scrapbooking Studio, The Digichick and Creative Market. I don’t offer bundles on Etsy for the simple reason that the file size is too large. But, if you are an Etsy customer, check out my coupon codes. Discounts start from $10 ; if you grab all the packs, your order will be larger than $10 and you’ll be able to use a discount coupon. Included in this paperpack are 12 hi res JPG files. You will receive 1 paper with a vintage flower basket pattern, 1 paper with a collage of vintage garden themed ads, 2 papers with an etched vintage rose pattern, 1 paper with a striped pattern, 1 paper with a plaid pattern, 1 paper with a wooden texture, 3 mixed media papers, 1 paper with a patterned burlap texture, 1 paper with a handdrawn dots pattern. 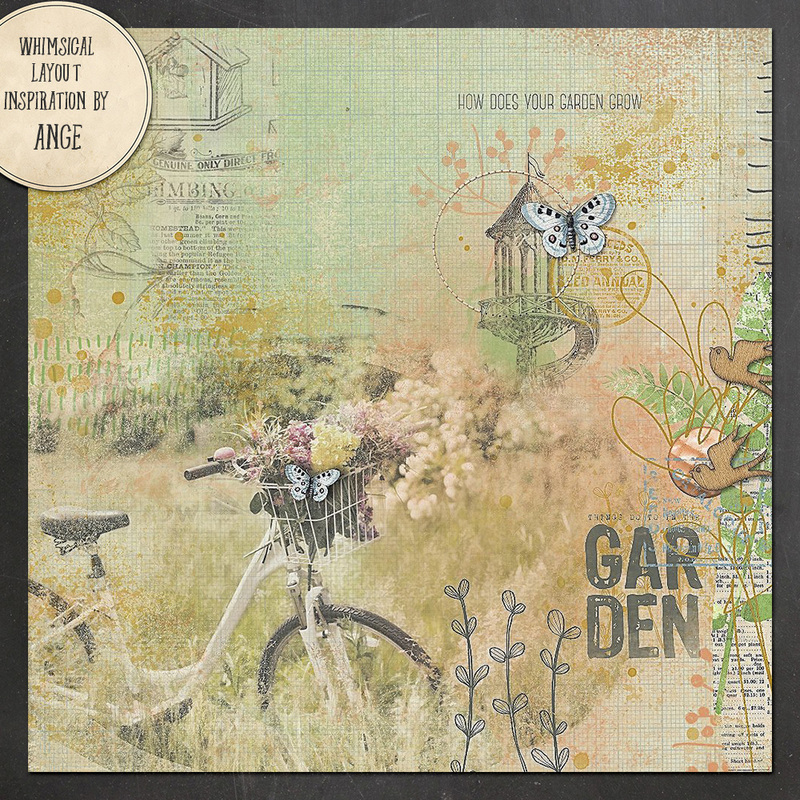 Discounted for a week and available at Digital Scrapbooking Studio, The Digichick, Etsy and Creative Market. Designed to coordinate with the rest of the collection… You will receive 9 hi res JPG files. 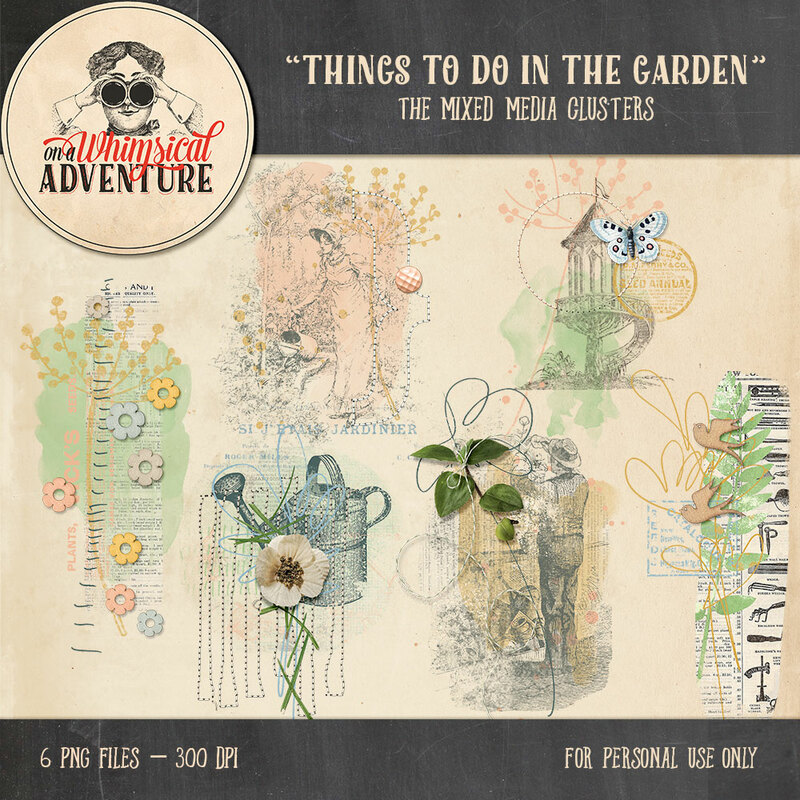 A delightful mix of vintage ephemera, realistic elements and handdrawn illustrations… 60 PNG files in total, including: 3 brads, 3 buttons, 1 bird charm, 1 butterfly, 3 mini clothespins, 2 stitched brackets, 1 chicken wire, 1 doily, 1 doily flower, 1 vintage postcard, 3 flowers, 1 wooden flower scatter, 2 leaves, 1 mixed media leaf, 1 paper leaf scatter, 2 frames, 1 cluster of grass blades in a shadowed and non-shadowed version, 1 vintage mini tag, 1 twine ribbon, 1 stitched cluster of messy rectangles, shadowed and non-shadowed, 1 seed spill, 2 round photo masks, 2 splashes of watercolour, 2 paint splatters, 2 sponge painted circle clusters, 3 handdrawn floral elements, 3 handdrawn leafy elements/clusters, 1 stamped ephemera flower, 1 handdrawn grass scribble, 2 handdrawn clusters of little stripes, 1 handdrawn cluster of messy rectangles, 4 floral scribbles, 4 vintage ephemera garden themed ad stamps, 1 vintage ephemera garden plan stamp. 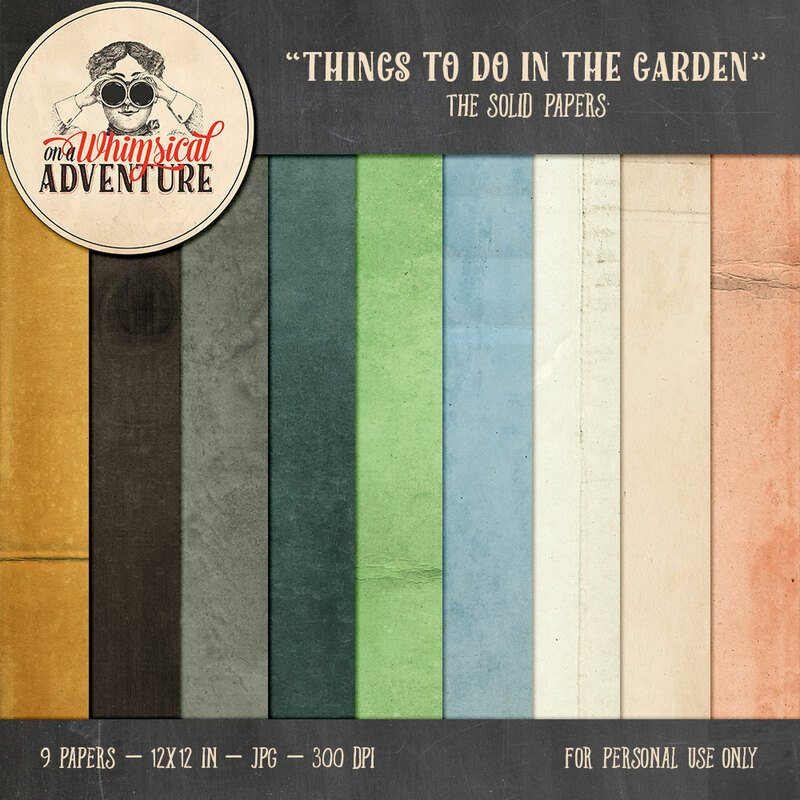 The kit contains the Elements, the Fantasy papers and the Solid papers. 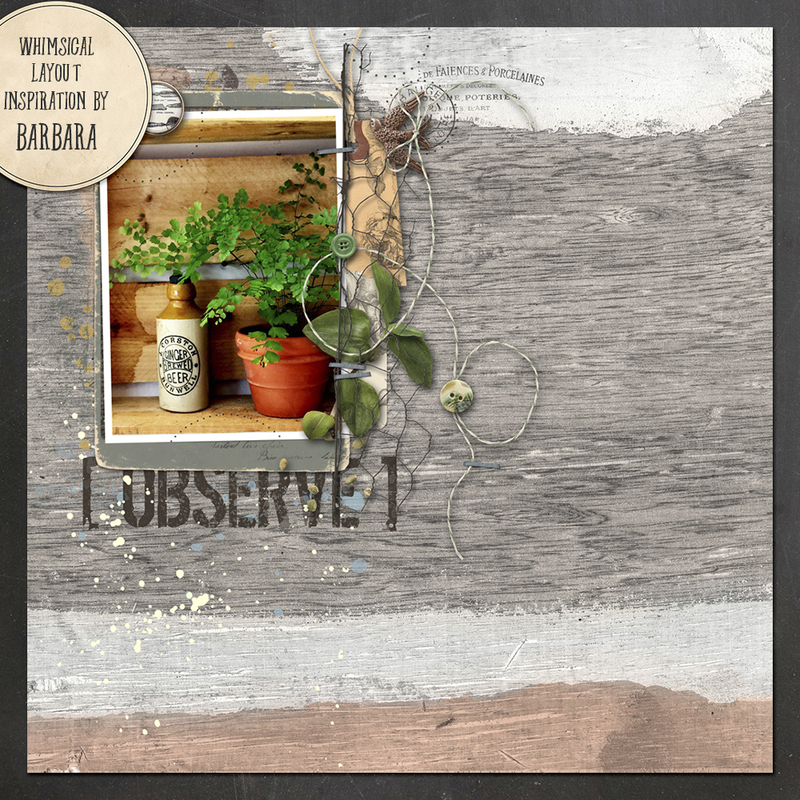 It is discounted for a week and available only at Digital Scrapbooking Studio and The Digichick. I had so much fun making these and customers like them! 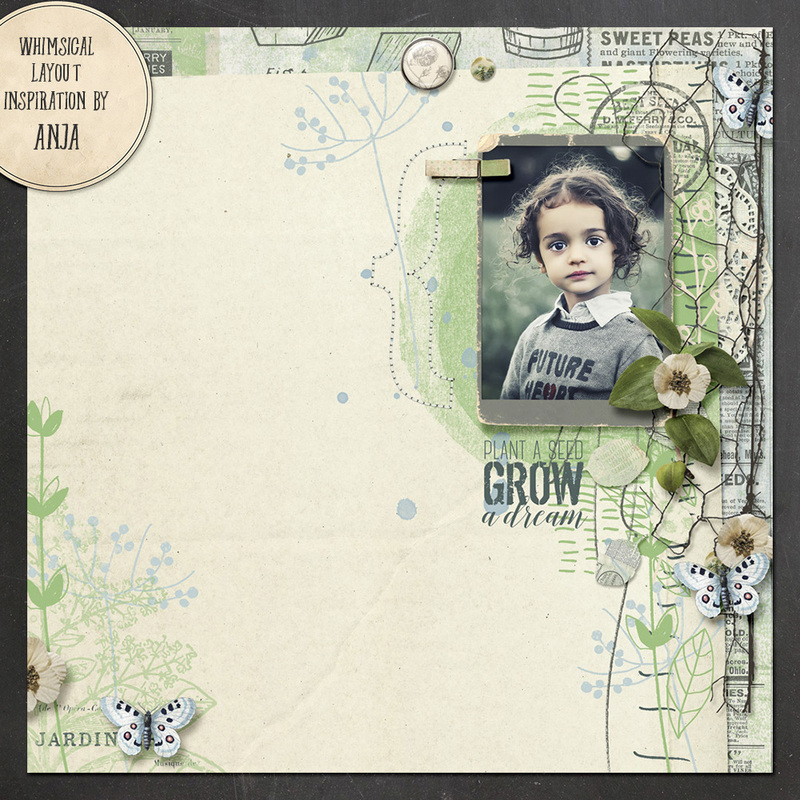 Included in this charming pack are 6 mixed media clusters. You will receive 12 PNG files (6 non-shadowed, 6 shadowed). 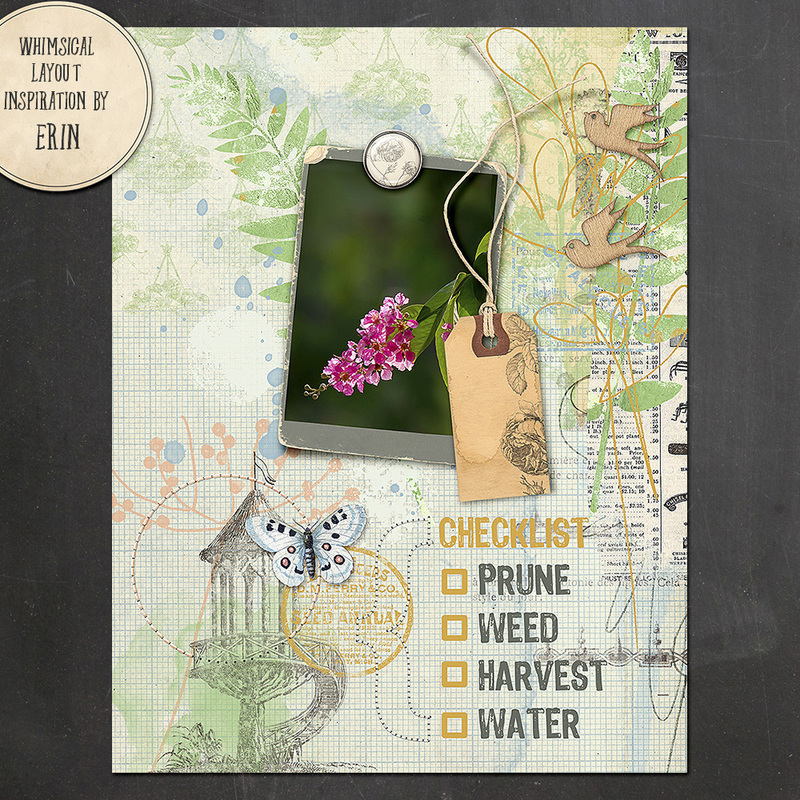 They are discounted for a week and available at Digital Scrapbooking Studio, The Digichick, Etsy and Creative Market. 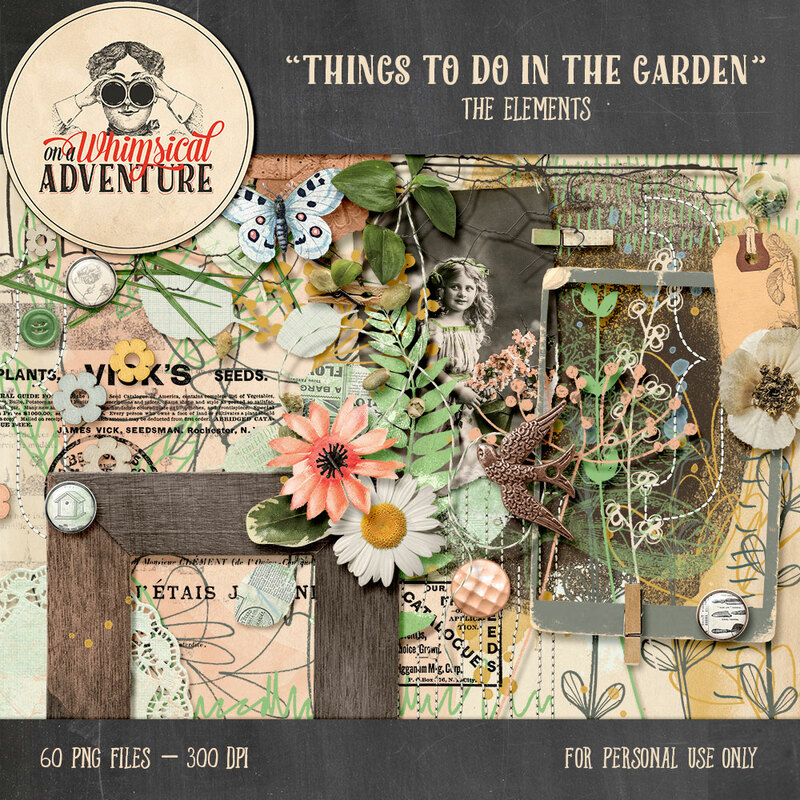 Included in this pack are 12 garden themed word art elements. You will receive 24 PNG files (a coloured and decorated version, and a plain black version). 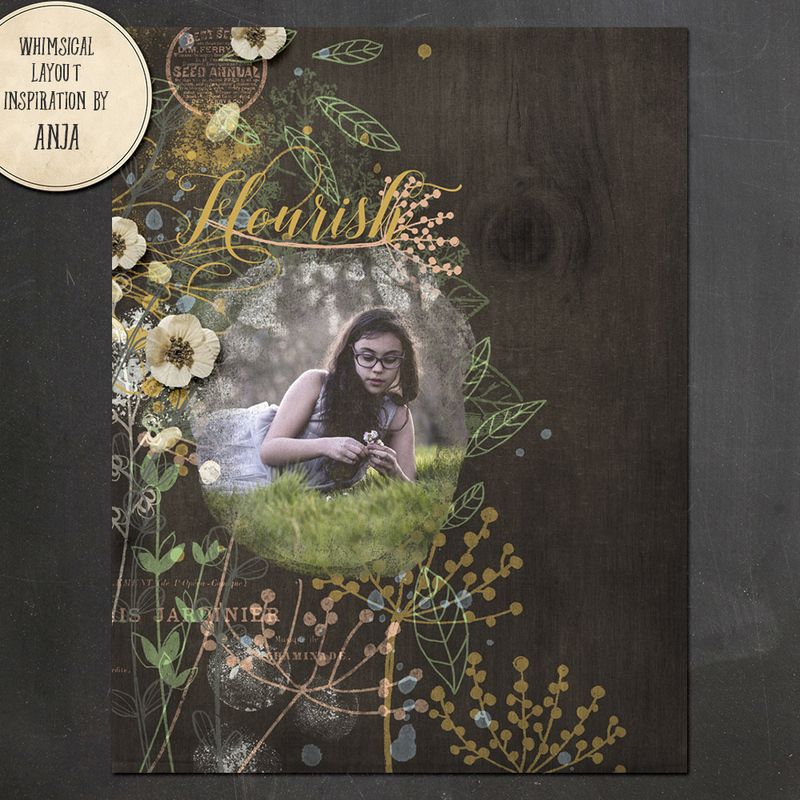 Discounted for a week and available at Digital Scrapbooking Studio, The Digichick, Etsy and Creative Market. 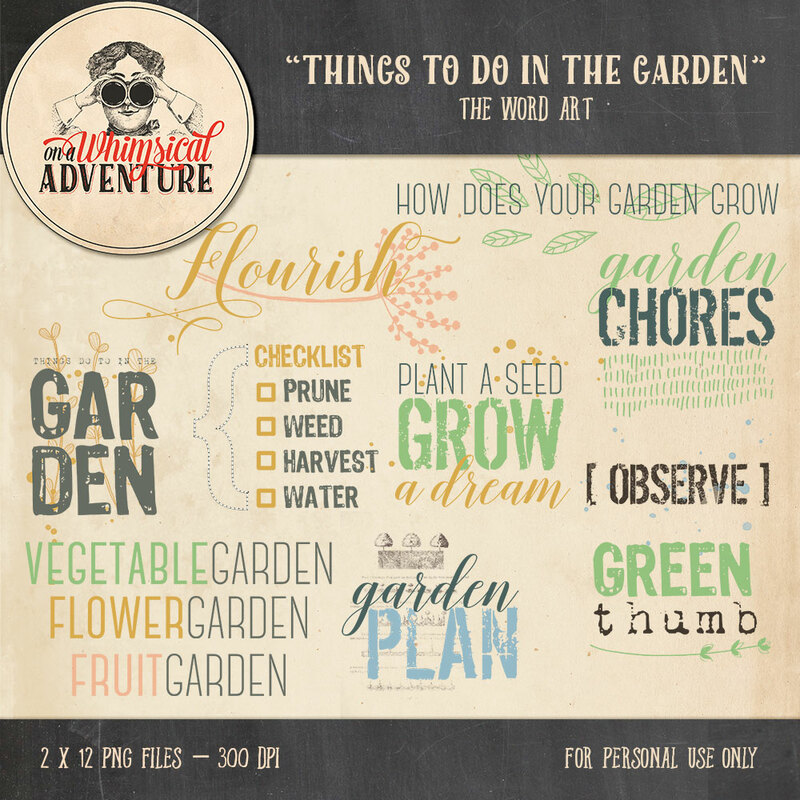 Ready to grow your own garden? 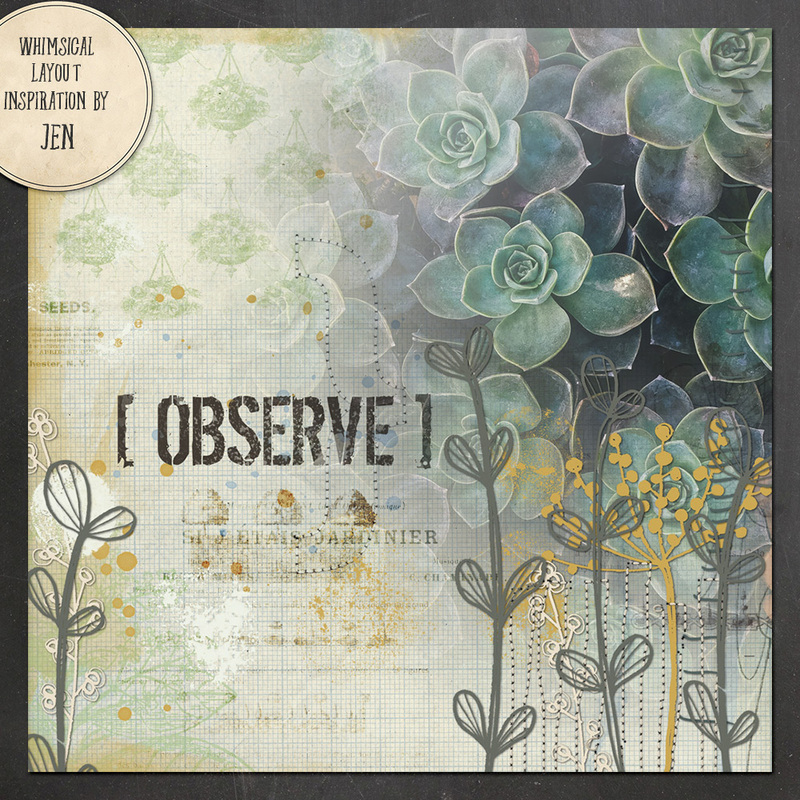 Then grab this collection while it’s discounted, in my shop at Digital Scrapbooking Studio, in my shop at The Digichick, in my Etsy shop, or in my shop at Creative Market! Are you a newsletter subscriber? Then a small sampler of this collection is on its way to you. If you haven’t subscribed yet, you can do so here. The Spring Fever Collection is still heavily discounted. It will remain so until the 28th of April. Separate packs are just $1 each, the bundle is available for just $6. As from the 29th, all the packs will go back to their normal prices and I will offer them in all my shops. Whimsical Challenge No1 is now closed. All the participants have received their discount coupons and one winner has been chosen by random drawing. A huge thank you goes out to all those who played with me! A new Whimsical Challenge has been posted in this thread. Are you joining me? This time I want you to tell me what your favourite TV show is and – if you can – why. 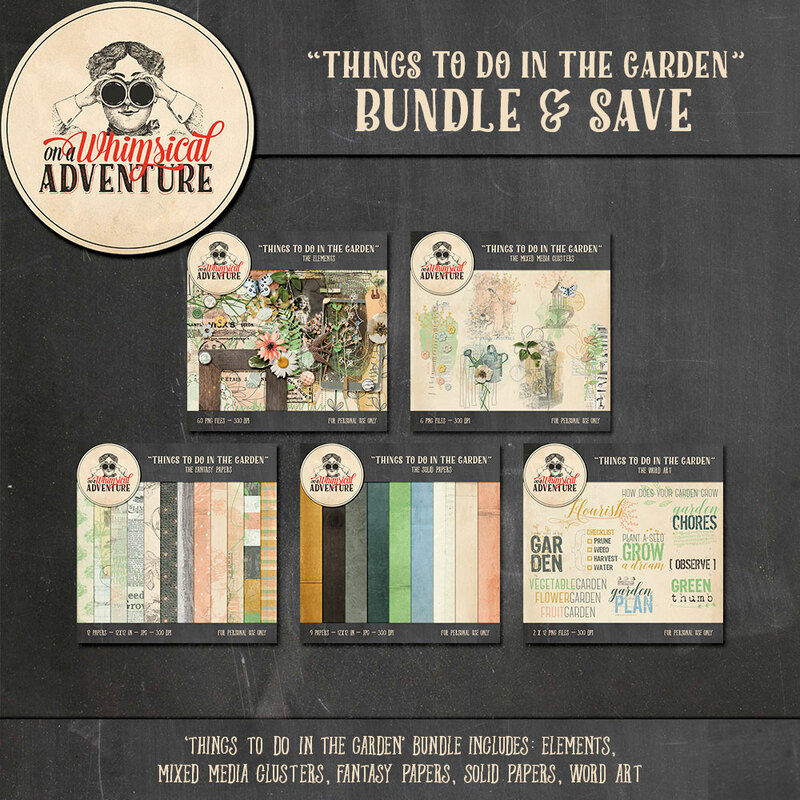 I used the following On A Whimsical Adventure packs: A Moment Captured, Among The Shadows, Bubbles And Splatters, Blue Skies Painted Papers. Maybe next time you’ll be the winner of a $10 coupon? Whimsical Challenges are now hosted at The Digichick as well! The lovely Beatrice is hosting the Whimsical Challenges at The Digichick for me, so if you’re a Digichick girl and you feel like playing, then you definitely want to go to this thread! The same rules apply as the ones at The Studio, but the coupons will be for my shop at The Digichick. And with that being said, I think I’m at the end of my post for this week! Have a wonderful week and see you next time!